The restaurant gives the East Bay a taste of his Vietnamese hit, The Slanted Door. At lunch, most diners assemble rice plates from pre-made dishes, such as beans, lamb belly, and mushrooms (right). Unless you're a student or faculty member at UC Berkeley, there's rarely a reason to eat on campus. That changed in October, when Charles Phan opened Rice & Bones, a Vietnamese-ish cafe, inside grey, concrete Wurster Hall. Phan is best known for The Slanted Door, his upscale Vietnamese anchor of the Ferry Building in San Francisco. It's one of the city's most enduring and important restaurants, popular with locals, tourists, and critics alike. In 2004, the James Beard Foundation named Phan the best chef in the region, and in 2014, Slanted Door took the James Beard Award for Outstanding Restaurant, a national honor akin to winning the Academy Award for Best Picture. Rice & Bones is Phan's first East Bay restaurant, fittingly inside the very building where he once attended classes as an architecture student in the '80s. The space looks chic for what is arguably a school cafeteria, with modern light fixtures and a long, wood communal table partitioning the room. Despite some early grumbles from students that Rice & Bones is too expensive for an on-campus eatery (it also doesn't accept student meal points), the place was slammed on all three of my visits. At about 12:30 p.m. on a recent Thursday, about 50 people queued up for rice plates, pho, and buns, but the staff moves everyone along remarkably fast. The selection changes throughout the day. In the mornings, students drop by for house-made pastries and coffee. By noon, staff members bring out what they call "the counter collection," featuring about five proteins and six to eight vegetable-based sides, served cafeteria-style. These change regularly and somewhat randomly depending on whatever chef de cuisine Dong Choi sees at the market, but the whole selection typically gets phased out every two weeks or so. By 2:30 p.m., these dishes are moved aside in favor of banh mi made with freshly baked bread. Choi promises that Phan was very involved in developing the menu and concept for Rice & Bones, though Choi mostly has creative control over the counter collection. For Phan, Choi said providing the campus with a real restaurant serving organic, locally sourced food was paramount. 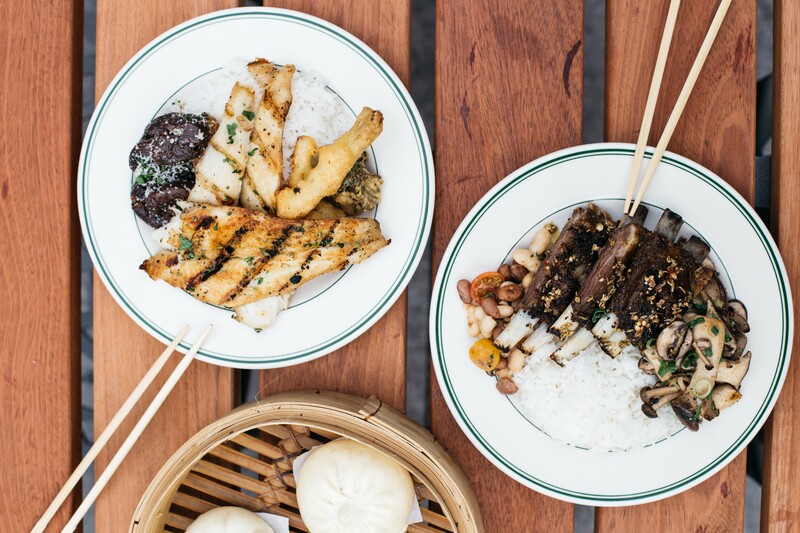 In a sense, Rice & Bones is like a little slice of The Slanted Door for the East Bay. A number of menu items are versions of Slanted Door favorites. The vegetarian imperial rolls are crunchy and light. Everything I tried was at least good, if not very good. With Phan's credentials, I couldn't help but hope for a little more, though perhaps those hopes were unrealistic and unfair given the setup. Rice & Bones serves its primary purpose exceedingly well: getting high-quality, tasty food to students and faculty quickly and at a reasonable price point. At lunch, most folks are in a hurry and opt for something pre-made on the counter. For $14, you get rice, a protein, and two sides. There's almost always a seafood option and vegan protein. I tried wild flounder sautéed with lemon and olive oil; charred, peppery lamb belly kissed with fennel; chicken legs roasted with herbs; and all were perfectly cooked and seasoned well. The sides were a bit more hit-and-miss but generally successful. I enjoyed the smokiness of the braised beans with bacon and cherry tomatoes. Slightly sweet, maple-roasted carrots; Chinese greens; and a mix of roasted mushrooms were all cooked just right, if a little boring flavor-wise. I was most impressed with the tempura-fried broccoli stems, aromatic with Chinese five spice and virtually oil-free. If you arrive by noon, these dishes will still be hot and delicious. If you get to Rice & Bones later, it's a bit iffier, as platters get refilled as needed without any heating mechanism. That's ultimately a good thing, as nothing risks getting overcooked as it sits. And while my meats were always warm, the sides tended to be cooler. Some items, like the beans or carrots, tasted fine at room temperature, but tepidness really hurt certain dishes, like the smashed and fried potatoes with Parmesan and browned butter. Choose wisely. Even though the display looks incredibly inviting, ordering off the menu usually means getting a fresher meal. The grass-fed beef pho, for example, arrived piping hot with a small paper boat of herbs. The light broth is countered by first-rate, razor-thin slices of beef that are still pink and rare. 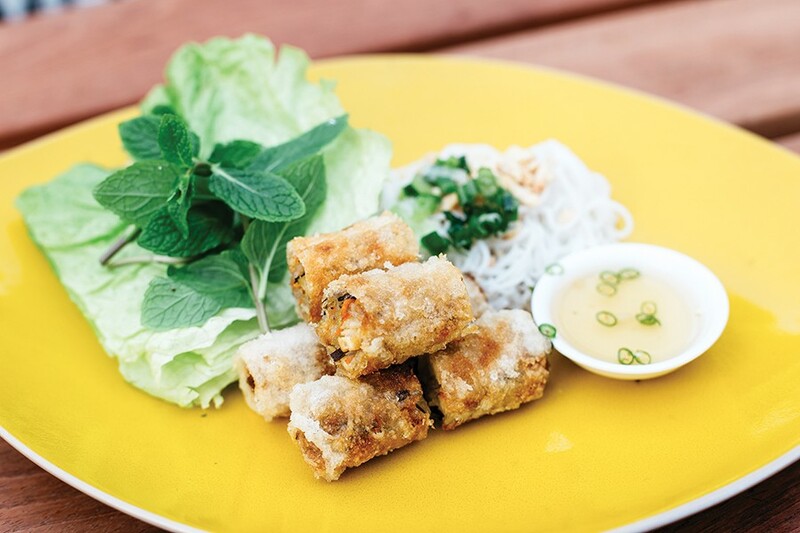 Vegetarian imperial rolls were fried-to-order, crunchy, and light, with herbs, vermicelli, and lettuce on the side for wrapping — a simple dish that could not have been executed any better. Classic shrimp and pork spring rolls come from the same recipe as The Slanted Door's version, and they taste just as great with a killer peanut dipping sauce. The Slanted Door's famed jicama and grapefruit salad is also on offer — pre-assembled for speed with the dressing on the side — and it's refreshing, slightly bitter, and lovely. When in doubt, order whatever is in the bamboo steamer baskets, in part because their contents stay nice and hot. The zongzi, a glutinous rice dumpling stuffed with Chinese sausage, salted duck egg yolk, and shiitake mushrooms, was well-made and generous on the meat. The beautifully proportioned, fluffy, and savory steamed buns are even better. At $4, they make a great snack while traversing campus or can turn an order of salad or spring rolls into a filling meal. While the menu sounds meat-heavy, there are always multiple vegetarian options, and many of those are vegan. In addition to counter options, there are mushroom steam buns, vegetarian zongzi, and spring rolls. Hours: Mon.–Fri. 8 a.m.–5 p.m.